(AKRON, OHIO) February 7, 2019 - In less than two months on Opening Night, April 4, Canal Park will once again be Northeast Ohio's epicenter of Affordable Family Fun. All 70 Akron RubberDucks home games in 2019 has fun, creative promotions in store, complete with the annual, jam-packed promotional calendar released by the club today. 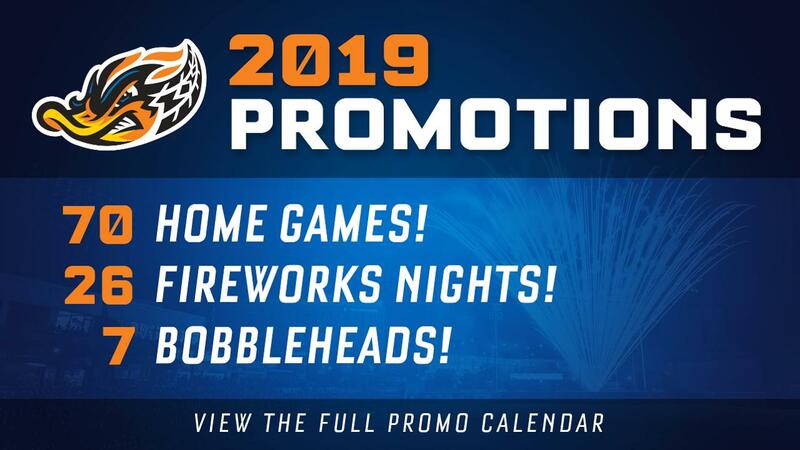 The 2019 Akron RubberDucks promotional calendar is packed with 12 premium giveaways, 26 fireworks shows, seven bobbleheads, guest appearances, returning fan-favorites, but also new promotions such as the nine T-Shirt Tuesdays. As always, games with bobbleheads and celebrity guests are the most anticipated. There are bobbleheads for the first 1,000 fans, during seven dates in 2019, including three when celebrity guests come to Canal Park: May 25 - Mayor Goldie Wilson Bobblehead from the "Back to the Future" movie series (presented by Repros), with actor Don Fullilove, who portrayed Wilson; July 20 - Warden Samuel Norton Bobblehead from "The Shawshank Redemption" (presented by Distillata), with actor Bob Gunton; and Aug. 24 - Kevin Malone Bobblehead from the hit television show "The Office," with actor Brian Baumgartner. The other scheduled bobbleheads include: June 15 - Craig Ehlo Bobblehead on Cleveland Basketball Night; July 13 - Ricky Vaughn Bobblehead on the annual "Major League Night"; Aug. 3 - Clay Matthews on Cleveland Football Night, presented by Serra Auto Park; Aug. 31 - Fan Vote Bobblehead as part of the team's "30 in the 330 - 30-Year Celebration." The 2019 season marks the 30th anniversary of the franchise's 1989 arrival in Canton and fans will have a chance during the season to vote for which player will be made into a bobblehead from the entire span in Northeast Ohio from the Canton-Akron Indians (1989-96), Akron Aeros (1997-2013), and RubberDucks (2014-present). SINGLE-GAME TICKETS will GO ON-SALE MONDAY, FEB. 11 AT 9 A.M. on akronrubberducks.com or fans can call 330-253-5151 and get season tickets, flex packages, fireworks packages and more. "We're so excited for the 2019 season and for fans to participate in the fun we have been planning," said RubberDucks promotions coordinator Kyle Hixenbaugh. "We have some fan favorites returning such as RubberDucks Comicon, Princess Tea Party, Bark in the Park, and 'Major League' Night, but the main focus has been to flip the script and create some new, fresh ideas for our awesome fans. With 3 celebrity appearances, 26 fireworks shows, and 21 giveaways (9 T-Shirt Tuesdays, 7 Bobbleheads, 5 Premium Giveaways), this season will be one for the books!" The list doesn't stop at bobbleheads with five more premium giveaways: Opening Night, April 4, the first 5,000 fans receive a magnet schedule; April 6 - Pop Sockets (first 1,000 fans); April 20 - 6-Pack Coolers (first 1,000 fans, presented by FirstEnergy); May 4 - Faux Backpacks (first 1,000 fans); and June 22 - Kids new alternate orange jersey giveaway to the first 1,000 kids ages 12 and under. "I'm looking forward to Warden Norton Bobblehead Giveaway (July 20) and Kevin Malone's (Brian Baumgartner) appearance from The Office (August 24)," said RubberDucks General Manager Jim Pfander. "Plus, the return of fan favorites like 'Look, My Hot Dog is GREEN!' (May 3) and the $1,000 Cash Dash (July 19) with Eddie Money-themed fireworks, where it truly pays to be RubberDucks fans!" The RubberDucks have become known for outstanding, musically-themed fireworks shows. Knowing that nothing brings fans of Northeast Ohio out to the ballpark like fireworks, the team expanded its list to 26 fireworks shows in 2019 (up from a record 23 in 2018), including every Friday and every Saturday starting in May. This year, there's two nights of bonus fireworks on Thursdays with the Maroon 5 fireworks on June 6 and the Peter Gabriel fireworks on Aug. 15. Planned shows include Justin Timberlake on May 3 (presented by the Akron-Canton Airport), Journey on July 12 (presented by National Interstate Insurance), and new Rock & Roll Hall of Fame members Def Leppard on Aug. 3 (presented by Ohio Savings Bank). New in 2019, there will be four fireworks shows selected by WONE-FM listeners: May 4 (presented by FirstEnergy), June 15 (presented by Summa Health), July 13 (presented by Summa Health), and Aug. 24. There will also be special shows on Opening Night, April 4 with AC/DC fireworks, May 26 with MC Hammer fireworks (presented by KeyBank), and Sept. 1 with Harry Potter fireworks. New in 2019 are the nine "T-Shirt Tuesdays" at Canal Park. At each of the nine night games, the first 1,000 fans will receive a special t-shirts at the gates that are tied to the theme of each game, including a fan-designed one on Aug. 13. "There is something every night for fans of all ages," said Pfander. "Kids will love Akron Children's Hospital Sunday Family FUNdays and the whole family will love the record 26 fireworks nights, including the two bonus shoots on Thursday in 2019, as we will be shooting every Saturday from May through the end of the season!" It all kicks off on a fun-filled Opening Night, Thursday, April 4 vs. Altoona Curve at 6:35 p.m. Fans will also be treated to AC/DC-themed fireworks show and 2019 magnet schedule giveaway (first 5,000 fans). In addition, Opening Night is a "Thirsty Thirsty" at Canal Park, presented by Budweiser, with $1 beer and soft drink specials. All the action starts on that Opening Night, from 4-6 p.m. during the first of four Main Street Festivals in front of the stadium in 2019. These festivals get fans in the mood with live music, face-painters, inflatables, and many more ways for the family to get ready for the fun of the game. The others run from 5-7 p.m. on June 14, July 19 and Aug. 23. This will also be a big season for replica jersey auctions, a great chance for fans to get a game-worn jersey and meet a possible Cleveland Indian. These include: June 14 - Akron Screamers, when the team will wear custom uniforms and hats in honor of Canal Park's monster 21-scoop sundae, The Screamer; July 20 - 1940's Prison Style for "The Shawshank Redemption" Night; Aug. 3 - Cleveland Football Replica Jerseys; Aug. 30 is the annual patient-designed jersey for the Showers Family Center for Childhood Cancer and Blood Disorders Annual Celebration Event with the Akron Children's Hospital; and lastly on Sept. 1 - Fauxback Jerseys. The RubberDucks are also using the promotional schedule as a chance to help the local community. Games with community ties include Portage County Reading Program (April 8), Summit County Reading Program (April 10), Stark County Reading Program (April 22), Medina County Reading Program (April 24), Military Appreciation Night (May 24), and Teacher Appreciation Night (June 13), Women's Equality Day (Aug. 25), and The Showers Family Center for Childhood Cancer and Blood Disorders Celebration (Aug. 30). Some games on the calendar has the RubberDucks partnering with local non-profit organizations for its "Charity Begins at Home" program to raise funds and awareness. This year includes working with Two Men and a Truck (April 8), the MS Awareness Day presented by the Oak Clinic for Multiple Sclerosis Awareness (May 5), Julie Billiart School (June 16), and the Optimist Club of Akron (July 21). Charity Begins at Home Mondays (CBAH) - Each Monday is a Charity Begins at Home night. The RubberDucks team up with a local non-profit organization to raise funds and awareness for its cause. Wellness Wednesday - Every Wednesday home game will be filled with fun ways to get active and stay healthy. Thirsty Thursday - Presented by Budweiser, featuring $1 draft beer and soft drink specials every Thursday game! Fireworks Friday - Enjoy post-game fireworks after every Friday home game! Giveaway Saturdays - Every Saturday features a premium giveaway to the first 1,000 fans! Saturdays also include celebrity appearances and post-game fireworks starting in May through September. A complete 2019 Akron RubberDucks promotional schedule is attached with the release and available on www.akronrubberducks.com. The Akron RubberDucks are the Double-A affiliate of the Cleveland Indians. The 2019 season, powered by FirstEnergy, starts on Opening Night, Thursday, April 4, at 6:35 p.m. vs. Altoona Curve.